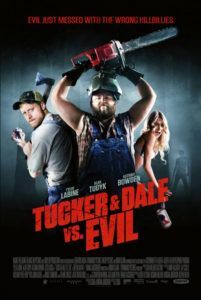 Director Eli Craig and writer Morgan Jurgenson’s Tucker & Dale vs. Evil takes the familiar horror formula where partying college kids are terrorized by white trash yokels in the middle of nowhere and turns it upside-down. Here, the hillbillies are charming and considerate (and innocent) victims, while the panicked youths allow their misconceptions to trigger a series of bloody accidents, which only furthers their hysteria. Without as many direct movie references as something like Shaun of the Dead, audiences who enjoy horror spoofs will undoubtedly delight in the film’s original satiric concept, as well as the pitch-perfect comic tone captured by Alan Tudyk and Tyler Labine, the titles respective Tucker and Dale. Beginning like a dozen or more horror titles you’ve seen, the film opens when an SUV load of students stop for beer and have an ominous encounter. Looking on, the overweight Dale laments to Tucker about his inability to talk to girls. Tucker tells him no problem—just laugh a lot and be himself. Too nervous to notice he’s carrying a grim reaper-style sythe, Dale musters up the courage and approaches their group, laughing like a nervous maniac, which of course is misinterpreted as the ravings of an Appalachian inbred. Like us, these college brats have all seen films like Deliverance, The Hills Have Eyes, The Texas Chainsaw Massacre, Wrong Turn, and other examples where hillbillies kidnap and torture yuppie students, so they immediately assume these two yokel-types have nefarious intentions. Not so. Tucker and Dale want only to drink beer, go fishing, and repair the former’s new “summer home”, a fixer-upper cabin in the woods. That night, as Tucker and Dale quietly fish, insufferable fratboy Chad (Jesse Moss) comes on to Allison (Katrina Bowden), who rejects him and joins the others by the lake. Lowering herself in the water, she slips and knocks herself out cold. As Tucker and Dale rescue her, Allison’s friends only see two rednecks putting her unconscious body into a boat and assume she’s become their latest victim. They organize a rescue plan involving homemade spears and a hatchet, while Dale uses this opportunity to talk to Allison, a country girl at heart. Allison comes to find, as we have long before, that Tucker and Dale may look the part of rednecks, but they’re both reasonably intelligent and compassionate guys who are never depicted as buffoons, just misunderstood. Meanwhile, the duo becomes convinced the students have formed some kind of suicide pact as Chad, driven mad by his cartoonish hatred of hillbillies, plans to systematically hunt and kill Allison’s captors, leading to a number of the college kids to accidentally kill themselves. Laughs are balanced between the shock of accidental, splattery deaths and the ironic escalation humor driving the film’s series of mix-ups. There’s lots of slapstick concerning chopped off limbs and buckets of blood, and this reaches its height early on to make way for the third act’s one-on-one confrontation between Dale and Chad, which is decidedly less funny (and grossly over-acted by Moss). What lasts throughout is the comic chemistry between Labine and Tudyk, who make these not-so-stupid characters into a lovable duo that should have their own series of films. In a way, it’s not unlike Abbot and Costello Meet Frankenstein or Abbot and Costello Meet the Mummy. One could envision a whole set of Tucker & Dale vs. BLANK movies and one could hardly argue against seeing this team reunite onscreen. Although set deep in the Appalachians, the film was shot in crisp digital in Alberta, probably because the filmmakers feared being raped and tortured by actual hillbilly mutants. After this movie, audiences are more likely to fear the more dangerous type: the unbalanced, needlessly aggressive fratboy. Tucker & Dale vs. 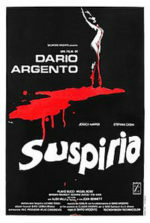 Evil premiered at the Sundance Film Festival in 2010 and has remained on the festival circuit ever since. After the film spent a curiously extended amount of time traveling, Magnet Releasing picked up the rights and will distribute into limited theatrical release and video-on-demand vendors, where it’s bound to become a cult favorite over time. 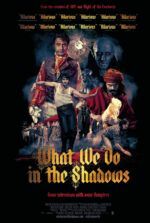 Within a few years, after the DVD and Blu-rays have sold and audiences have had a chance to discover this film, here’s hoping Craig and Jurgenson return to these characters.